But as you know this is just the start of our work and we have lots more opportunities to get involved! PPP have joined forces with Transition Town Peckham who are looking for some Guerilla Gardeners! Holly and me (Hannah) will be building raised beds with scaffolding planks, creating a bin store and setting up compost bins, with a community fun day to go ahead on Saturday 26th when we’ll be planting seedlings and making signs. We’d love some help to get this going, green fingers are not necessary but enthusiasm is a must! Holly Grove is getting a temporary make over with some buff coloured chalk paint to represent what could be a gravel path. We need people to help us paint the ground. Street painting can be great fun, we’ll get the paint rollers out and as the paint is eco-friendly and non-toxic it’s not dangerous for kids to get stuck in too! We are looking for a Structural Engineer who would be willing to do some pro-bono work assessing the garage roofs in Bournemouth Close in preparation for pot plants in the first instance and a green roof for the permanent stage. Does anyone know where we might get some old scaffolding planks, preferably for free or cheap? We want to build a community garden with them in Bournemouth Close 23rd– 26th April. I think that’s more than enough for you to go on for now. Please email me on hannah.padgett@sustrans.org.uk or call on 07766 577772 if you are interested in lending a few hours, a few days or anything in between on any of the above! And remember to SAVE THE DATE – 7th June! Reblogged this on Transition Town Peckham. I will try to come on 25th too… can also handle a brush! come on… step up peeps with brush skills… it will be fun! 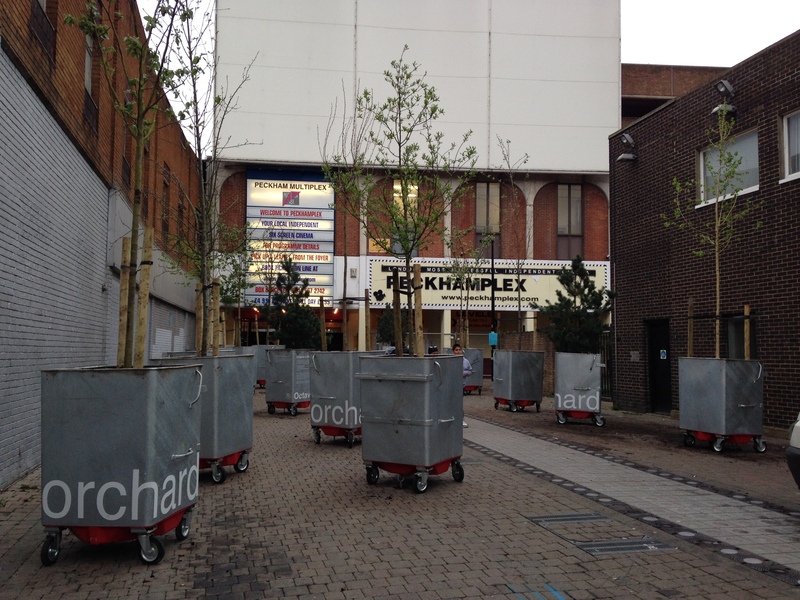 At first I thought it was some organisation selling trees outside the cinema. Then upon closer inspection I saw the fantastic assortment of trees species in steel containers. The added information on the steel containers about these trees was useful. Congratulations on the hard work you all put into making this idea come alive. I wish we could have a real tree / ochard in this vicinity.